When it comes to creating a signature soiree look, you know nothing nails it better than a little black dress. But since the sartorial stakes are a bit higher during the holidays, you need to call on the three Gs: glitz, glamour, and GUESS. From a shoulder-baring frock perfect for ringing in the new year to a sparkling sequined number designed for holiday cocktail fetes with friends, the Little GUESS Dress will have you covered throughout party season. Scroll down to shop the Little GUESS Dress, and more. 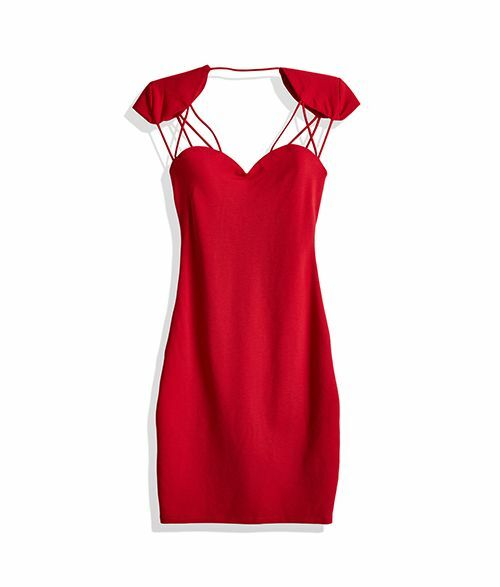 A body-hugging dress is a party VIP that always packs on the drama. Try experimenting with this off-the-shoulder version paired with sleek booties. Be bold this holiday season, and go for head-to-toe sparkle in a sequin dress. Intimidated by the look? Just try a frock in a more neutral hue, like sophisticated silver. A long-sleeved mini is perfect for chilly winter nights. Throw on a glamorous shag coat and the perfect clutch for added opulence. This black corset dress helps create an enviable hourglass shape, and will make a lasting impression at any soiree. This little red number is waiting to ring in the new year with you. Still see yourself as a sequin rookie? You’ll change your mind for this patterned frock, which packs just enough shine for your first time out. Opt for a high ponytail to accentuate your neckline in this glamorous one-shoulder dress. Add a touch of romance to your ensemble with a lace dress, like this plum version that’s versatile enough to wear beyond the holidays. Which Little GUESS Dress will you shop for during party season? Tell us in the comments below, and shop more dresses HERE.